Self Sense wins the Mornington Cup, 23/3/19 (Racing Photos). 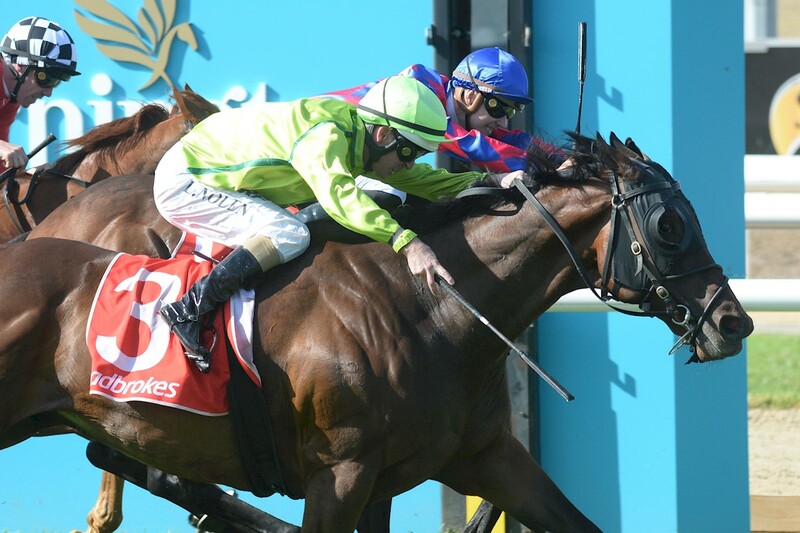 Self Sense continues to prove his versatility as David Brideoake’s eight-year-old gelding won Saturday’s $350,000 Listed Ladbrokes Mornington Cup and secured a ballot-free exemption into October’s Group 1 Caulfield Cup. Adding a fourth country Cup victory to his CV, the win followed a 7-day back up from his upset victory in the 1950 metre $125,000 Yarra Valley Cup. His other Cup wins have been the Listed Kilmore Cup (1600m) and Listed Ipswich Cup (2150m) and he has placed in three others. Homebred and part-owned by his trainer, Self Sense has raced and won on both the flat and over the jumps during his 59 start career. With victories including the VOBIS Gold Heath, the Australian Hurdle, VOBIS Gold Stayers, and Kevin Lafferty Hurdle, as well as a second in last year’s Grand National Hurdle, he has won over $1.47million in prizemoney and Super VOBIS and VOBIS Gold bonuses. “The jump racing has really lifted him to another level and by mixing the jumping with a little bit of his training, he’s an easy horse to maintain and he’s just so genuine,” said David. Self Sense is by Darley Kelvinside shuttle sire and Kentucky Derby winner Street Sense (USA). His dam, Be My Person, is a 2-time winner that David also trained. Before she passed away in 2015, she had 8 foals to race, all bred and trained by David, including Group 3 SAJC Auraria Stakes winner Shylight. The dam’s pedigree lines are impressive, with her dam (Kiwi Rose) being by the Mr. Prospector sire Straight Strike (USA), sire also to Shadea, the dam of Lonhro. Her granddam Lady Whyllie is also a half-sister to dual Group 1 winner Dalmacia. David told Racing.com on Monday that the gelding has pulled up well from Saturday’s win and will continue his flat campaign in Sydney in the Group 2 Chairman’s Handicap (2600m) at Randwick on 6 April. “If we were lucky enough for him to go well and win that (Chairman’s), we would probably have a shot at the Sydney Cup,” David said.